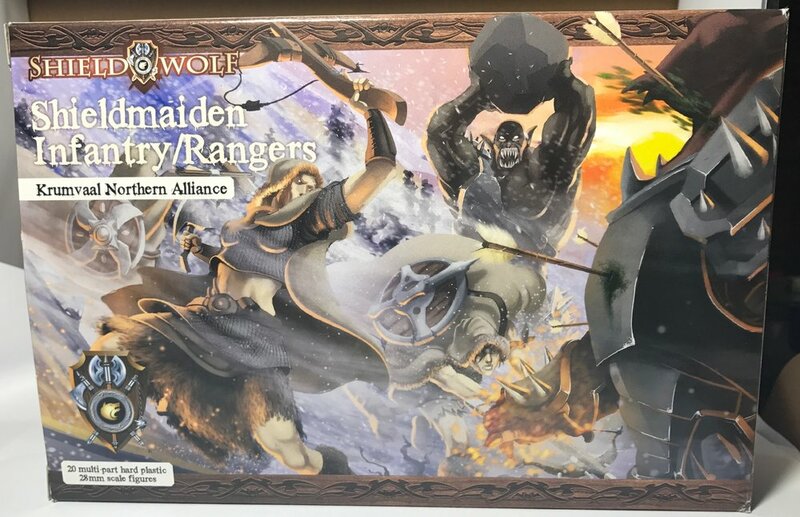 I recently purchased a set of models from Shield Wolf Miniatures, their Shieldmaiden Rangers so I thought I'd post an unsponsored review. It also produces infantry, but I wanted rangers. I have bought through Shied Wolf before, and before we get to the minis themselves I have to say, their ordering process is very good. I preordered these miniatures, they were sent on the proposed date and arrived half way across the world 2 weeks later. Package tracking would be good, but it never really works internationally anyway. If you want a reliable and prompt service, these guys have been great for me. Now, on to the miniatures. First up, the box! If you're ordered from Shield Wolf before this might be a surprise. My last order was a plastic bits box with my resin models in it, this time it's a more retail quality cardboard box with sprues. There's a nice picture on the front too, but note the scale in the bottom left corner, 28mm! This is important later. Open it up and there are the spues, and these are excellent. Well connected with hard plastic and no connections to spindly model pieces. The hardest part to slice off is the connection to the crossbow, but they should easily be cut with a sharp hobby knife or good quality clippers. I used clippers and then cleaned up with the knife. Separate bases, all 25mm in a baggie and I didn't really want these so I put them to the side. I've already clipped the miniatures off this sprue, but there's enough here to see the detail. Here are 5 of my beautiful ladies standing in the stiff breeze of the blistering cold of the north. Separate arms, weapons, heads and cloaks making two types of models. I've elected the crossbows, but I have to admit I'm tempted to go back for another set to get the hand weapon and shield options. This is my favourite model. So purposeful and indomitable striding across the battlefield after just killing your comrade with wilful disregard. There are enough variations in the bodies and legs to make a very dynamic unit. 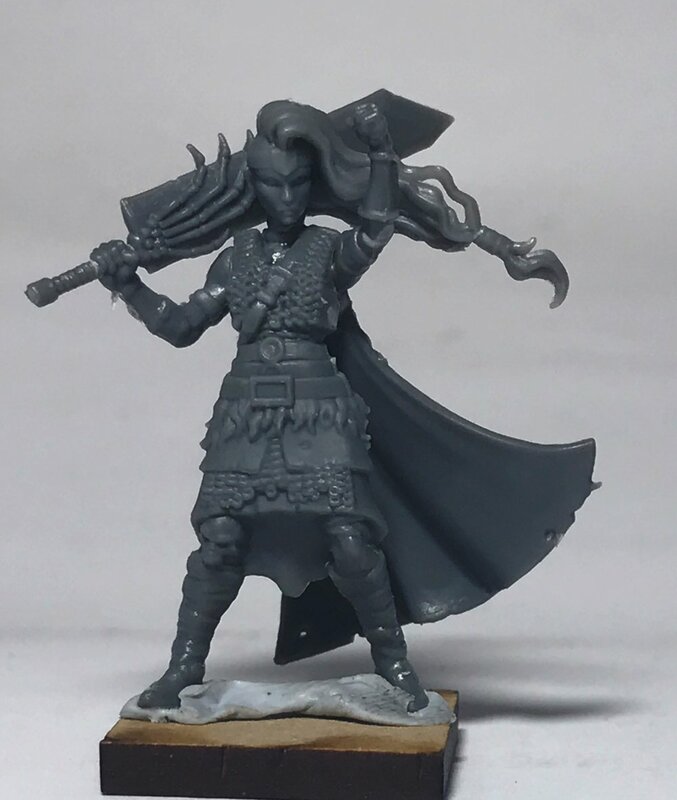 I'm a big fan of the portrayal of strong female models in a fantasy setting and I think that's a large part of what appeals to me in these models. On to the negatives. The box is very specific, these are 28mm models. Well here they are against 4 other 28mm models from mantic and GW (well at least GW from 6th ed when they weren't so epic just looking at them would make your nose bleed). These Nordic ladies are tall, no doubt. That works well for my army, but make sure you bear it in mind when ordering. All the models have flowing hair blowing in the breeze flowing to their left, well all except one. There is just one model with their hair flowing the wrong way. Now you could have this one checking your rear flank, but I'm not usually in the practice of facing my miniatures the wrong way. Lastly there isn't a lot of depth in the casts. Some of the areas blend seamlessly into each other with no clear borders. The image here accentuates the problem a little because of the extreme close up, but you get the idea. If you're a strong painter, this won't be a problem but if you're into drybrushing and inking then some areas will be diffult to get right. These models are excellent value for money, have a ton of character and are very posable. Some of the detail will rely on your paint skills, but for the most part the miniature has enough depth for a simple paint. They are a little out of scale, but if you're using 8th ed miniatures from GW or any epic or 32mm scale models they will fit in fine, otherwise just pretend that women from the north are just grown bigger. All in all, I'm super excited to paint this unit. I haven't yet decided if I'm going to pain them as northern warriors or Amazons, guess I'll paint test a couple and decide then but they could easily pass for either. They look great, they have so much character and they didn't cost me much. I only hope that Shield Wolf continues to produce quality miniatures at a competitive price. Here's two more pictures of the unit champion, WHAT A SWORD!